Life as a timber merchant has often been a steep learning curve. I’m not ashamed to say that many mistakes have been made, some worse than others! Below I thought I would run you through some of the screw ups I’ve made on various shipments over the years. Complex and arduous shipping regulations can easily trip one up. For example, about a year ago I’d been routing our shipments from Africa via Montreal as the overland to our factory was cheaper than shipping via New York. Tough luck! There is no third choice! All the wood had been fumigated and was insect free, and we believed we had all the correct permits, only to have them point out that the permits were for USA and not for Canada. The wood was destined for the USA but this did not satisfy them, as the containers would be on Canadian soil while in transit. Damn – what to do now? Although I did my best to turn on the charm, they were not interested – not the Port Authorities, the Shippers, Pest and Plant Control, Department of Forestry – all my efforts and pleading fell on deaf ears. I begged for the containers to be loaded back on the vessel and shipped to a USA port. This was also refused as these containers had now been “red flagged”. In the end I was left with no choice but to ship the containers all the way back to Cape Town, South Africa!! Needless to say, it was a costly error. Our first ever inbound shipment to the US was four 40 ft containers containing apple bins full of turning squares. That one fell foul of the rules, as the bins were not heat stamped (although they had been fumigated!). Quite rightly there are explicit rules on treatment and marking of softwood packing material to minimize insect infestation into Canada and USA, I just hadn’t got the fine print quite right. 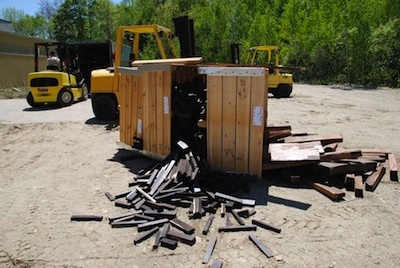 Luckily I escaped pretty likely though – the authorities allowed us to destuff in bonded warehouse in Montreal and repack goods in correctly heat treated wood. In the end that cost about $15,000, but was a harsh lesson well learnt. Often it isn’t customs that causes the issues at all. Sometimes it’s simply the packing of the shipment. Over the years we’ve had bad tallies, bad strapping, bad stickering and bad packing. Have a look at some of the pictures, and spare a thought for the days we spent cleaning up those messes. Then there is the pain we cause ourselves – broken bundles and forktrucks that break down or get stuck in sand, mud or snow. Not to mention the discomfort of working in super hot containers in the middle of summer when you are just about to collapse with dehydration! Most of the time they go smoothly!